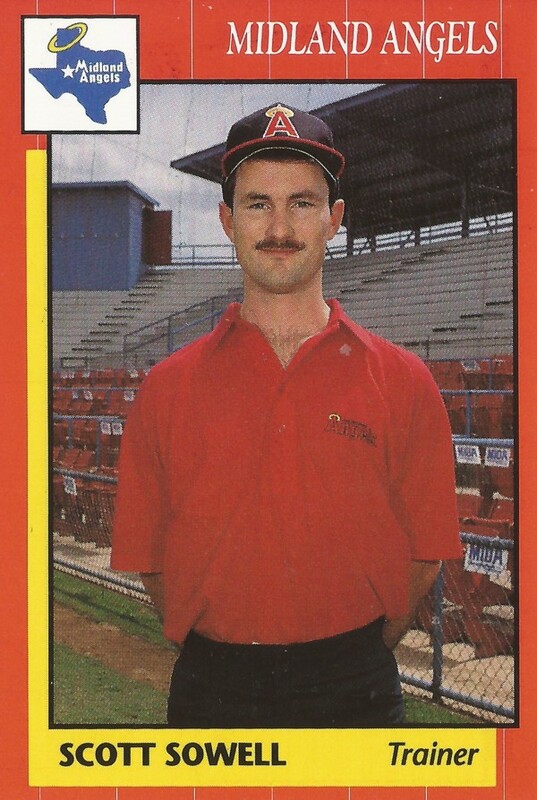 Scott Sowell spent his first season as a pro trainer at AA Midland in 1990, but he got his start in the Olympics, according to his Grand Slam card. Sowell counted his participation in the 1984 Los Angeles Olympics on the sports medicine staff as among the highlights of his career to that point, his card reads. He then went on to his time in professional baseball. He served as trainer at Midland for at least three seasons, and possibly more. Sowell started in college at Cal Lutheran. He received his bachelor of science degree in athletic training there. He then went on to Cal State-Fullerton, where he got his masters degree in biomechanics and exercise physiology. "One of his goals," his Grand Slam card reads, "is to always stay current with the technological advances in sports medicine and biomechanics." Sowell got a card in 1990. He then does not appear to have gotten another card until 1996, again as trainer at Midland. His final card came in 1997, also at Midland.